GMMRers..what a day! What a day! I was lucky enough to participate in the Golden Derby online Q&A with my #1 TV boyfriend, John Krasinski. Needless to say it was a thrill. There was a slight moment of panic when John couldn’t get into the chat, but his publicist, Rebecca, was kind enough to transcribe all of John’s answers for him. As if the Q&A wasn’t fun enough, I also was stoked to receive a nice note today from John Krasinski himself. It completely made my day…week…year. Just wanted to say hi and thanks so much for all your AMAZING support! The Office loves your website!!! Swoon. Um, John Krasinski knows my name? AND he knows how to spell my name? My dad doesn’t even spell my name right. Sigh. Anyway, we got some great scoop from John including what it was like to film Casino Night, how he feels about the Emmy buzz, what he thinks of the fans, who his favorite office-mate is, and much, much more. The following in a transcript of the Q&A put together by Tanster of OfficeTally.com. You guys have NO IDEA how hard this was to transcribe, and how long it took. So PLEASE head over to OfficeTally.com right now and thank Tanster for doing this. Now, sit back and get ready, because there’s a lot of J. Kras goodness ahead. JK: TANSTER – We are all very much aware of all the incredible sites and when I have the time, I defintiely have visited a few. Yours ROCKS, thanks for all the support!! GMMR: John, I read that your heard about our petition to “Supersize the Office”. Can you talk about the fan impact on the show? JK: The Secret was a lighter, funnier episode because he was getting cheered up by Michael, so it was a big Steve & John episode, which was really fun. Tom O’Neil: And Casino Nights? JK:…and then Casino Night was just one of the most fun experiences he’s had, and definitely the best episode they’ve done. Tom O’Neil: Do you know what episode was submitted in the series race? 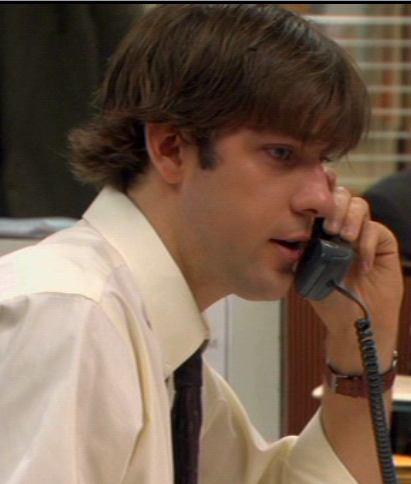 JK: BTN – yes, the Casino Night has the moment where Dwight dares Jim to be telekenetic, it’s hysterical. Amelia: Here’s my question, John. I know that you wrote the screenplay to the book “Brief Interviews with Hideous Men”, but I read that you are also to direct it this fall. Is this true? Can you say anything new about this project? Thanks and much love. JK: AMELIA – Yes, thanks so much, I’m so psyched that you know about that. I did adapt the book and will direct it in the fall. It’s basically been something I’ve wanted to do since college. I did a reading of it in college and have always wanted to adapt it, and i’m really looking forward to shooting it this fall. I’m terrified but also really excited. JK: I actually have no idea the writers haven’t been assigned scripts yet so we are as excited and anxious as you all are to find out! Boomer: What are your expectations for the Emmys? In the other categories, do they expect the show to get in the Series race and Steve Carell in the Lead race? JK: I have absolutely no expectations about the Emmys. I am so excited to even be considered. I am most looking forward to whether or not the show will be nominated because we’ve just had so much fun and we truly believe it’s a really really great show on TV. I’m hoping for everyone there that the show and the writers are nominated, and even though Steve Carrell is still a struggling actor, I think he has a shot. JK: Yes, we’ve been doing pre-production on Brief Interviews while I’m shooting the film LICENSCE TO WED, but I’m having a lot of fun. JK: The press are absolutely not hypocrites. I was very nervous to see how the show would turn out as well but as soon as we read the first original script, which is “Diversity Day”, we knew it was something fresh and original. There is something to be said about being the underdog and gaining respect genuinely we knew we had a really hard job to do. You cant blame them for being wary the british version was such a good show. Professor Chaos: John, without naming any names, has there been any discussion of Carell’s Frat Pack brothers (Stiller, Ferrell, etc) to guest star next season? Or any other high profile actors that have expressed interest?JK: We just found out that we have two GREAT directors next year that I’m psyched to work with but I can’t tell you who they are just yet just know they are AMAZING. JK: Ryan Adams / Heartbreaker…Wilco / Kicking Television…Clap Your Hands/Say Yeah…Death Cab / Plans…and…Bright Eyes / I’m Wide Awake It’s Morning. I know that not all of those are brand new but I get hung up on certain albums from week to week. JK: I would love to write an episode of The Office. I’d be very nervous because i find myself more excited for the writers new ideas than coming up with my own. JK: I LOVED Martin Freeman on that show, so I think I tried to take the same situation that Tim was in and apply it to Jim. But as far as acting differently, I hope I took all the best parts. OfficeFan2010: John, who is the most likely to either crack up or forget their lines? & also, how many takes were there to film the “I’m in love with you” scene & “the Kiss” scene? JK: Most likely to crack up is probably Mindy Kaling (Kelly). lindseykaye: what is the best adivce you have ever received? JK: The best advice i’ve ever received… hmm. I guess no matter how cliche it sounds, an old acting teacher asked me if I was having fun because at the end of the day, if you’re not having fun it’s not really worth it. Also, however obscure it sounds, the worst thing you can possibly do in life is anticipate what’s coming next, so there’s no need to worry about it until it happens. That helps me a lot with all the incredible things that are happening with the show i’m happy to be along for the ride. JK: Dear god, shooting the scene in the van with Steve and Rainn will go down in history as one of the most fun moments i’ve ever been a part of it was the BEST. Atypical: John, how do you think the Jim/Pam dymapic will change now that he’s confessed how he feels about her? Was it a good or bad choice to have the confession in the finale? JK: There are so many amazing people that I’d love to work with I gotta say, Robin Williams, who I’m working with now, is tough to beat. SheIsTheSunlight: John, to break up your typical Office-related questions a bit, let me ask… If you could be a superhero, what would your a) super power be and b) your superhero name be? JK: I can’t tell you how much fun this was! Thank you guys SO much for coming in. This was so wild and you have no idea how much each and every one of us appreciate the support and cool fan participation like this. We are defintiely, definitely, DEFINTELY lucky to have you guys, thanks for everything. Bye. And for those of you who had asked, here is where you can send John’s fanmail. I wanted to tell you that I connected with John’s publicist after the chat, and she and I decided to touch base later in the summer to see if we can’t set up an interview with John. I’m not promising anything but it may happen. Thank you, thank you, thank you! This was a wonderful interview! Ah I’m so jealous John knows your name! That chat was really great to read- you must be on top of the world!! Oh wow…that was a goodie! It’s actually a good thing that I wasn’t involved in that chat because I would have asked JK for his hand in marriage and completely ruined the vibe. LOL. GMMR & Tanster are THE BEST!! Incredibly awesome. Way to go! JK loves Ryan Adams, Wilco, and CYHSY? Okay, he is DEFINITELY my new TV boyfriend. That Ryan Adams CD is my favorite CD of all time.